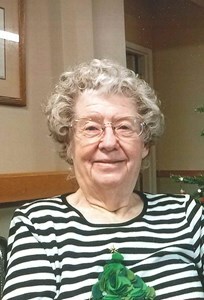 Helen Christina Fenwick, 90, of Topeka, passed away Saturday, January 26, 2019. She was born November 19, 1928, in Ottawa, Kansas, the daughter of William and Effie (McGinley) Caudle. Helen was employed at Josten's retiring in the 90's. She was a member of the Moose Lodge in Topeka. Helen enjoyed camping, fishing and vacationing with family. In later years she found solace in completing jig-saw puzzles especially Thomas Kincade puzzles. Helen married Donald E. Fenwick he preceded her in death. Survivors include a daughter, Linda Sue Munoz, grandchildren, David Fenwick, Christy Hoyer, Andrew Hoyer, Amy Hoyer, great-grandchildren, Wyatt, Parker, Charlie. A Funeral Ceremony will be 1:00 pm., Friday, February 1, 2019 at the Mount Hope Cemetery & Funeral Chapel, 4700 SW 17th St., Topeka where family will greet friends one hour prior. Memorial contributions may be made to St. Jude Children's Research Hospital 501 St. Jude Place Memphis, TN 38105 or Dementia Society of America - PO Box 600 - Doylestown, PA 18901. To leave a special message for Helen’s family, please click the Share Memories button above. Add your memories to the guest book of Helen Fenwick.